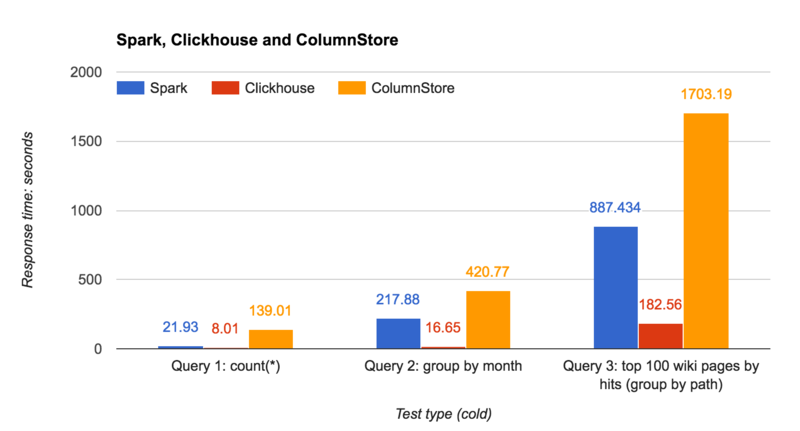 This blog post shares the results for the Wikipedia page counts (same queries as for the Clickhouse benchmark). In the following posts I will use other datasets to compare the performance. 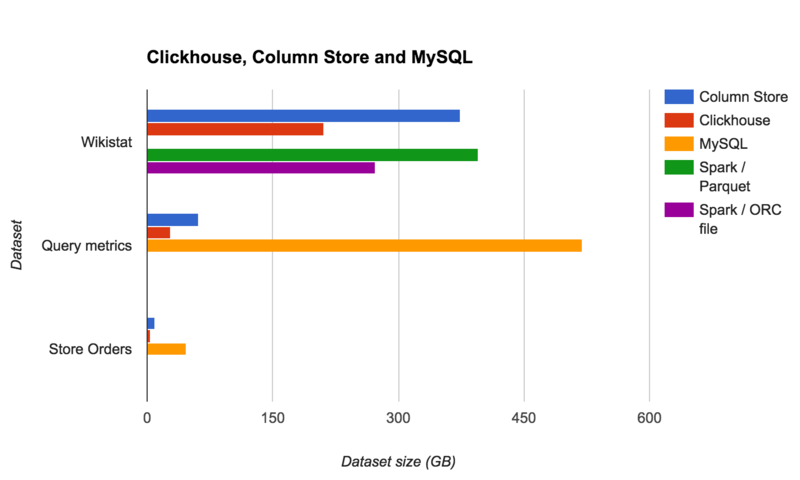 I’ve loaded the above data into Clickhouse, ColumnStore and MySQL (for MySQL the data included a primary key; Wikistat was not loaded to MySQL due to the size). MySQL tables are InnoDB with a primary key. All of the solutions have the ability to take advantage of data “partitioning,” and only scan needed rows. Clickhouse has “primary keys” (for the MergeTree storage engine) and scans only the needed chunks of data (similar to partition “pruning” in MySQL). 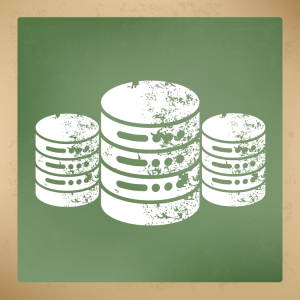 No changes to SQL or table definitions is needed when working with Clickhouse.
? 2077594099 ? 1 ?
? 1969757069 ? 2 ?
? 2081371530 ? 3 ?
? 2156878512 ? 4 ?
? 2476890621 ? 5 ?
? 2526662896 ? 6 ?
? 2460873213 ? 7 ?
? 2480356358 ? 8 ?
? 2522746544 ? 9 ?
? 2614372352 ? 10 ? As we can see here, ClickHouse has processed ~two billion rows for one month of data, and ~23 billion rows for ten months of data. Queries that only select one month of data are much faster. 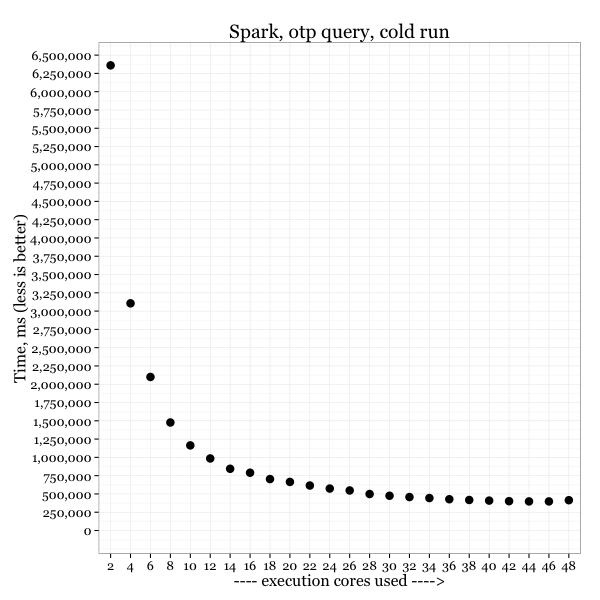 Apache Spark does have partitioning however. It requires the use of partitioning with parquet format in the table definition. Without declaring partitions, even the modified query (“select count(*), month(date) as mon from wikistat where date between ‘2008-01-01’ and ‘2008-01-31’ group by mon order by mon”) will have to scan all the data. *Spark does not support UPDATE/DELETE. However, Hive supports ACID transactions with UPDATE and DELETE statements. BEGIN, COMMIT, and ROLLBACK are not yet supported (only the ORC file format is supported). 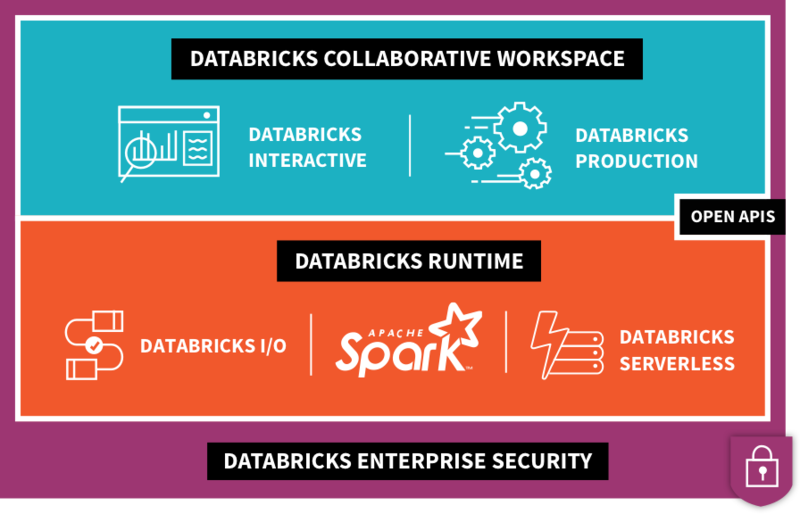 MariaDB ColumnStore and Apache Spark. If you are looking for the best performance and compression, ClickHouse looks very good. At the same time, ColumnStore provides a MySQL endpoint (MySQL protocol and syntax), so it is a good option if you are migrating from MySQL. Right now, it can’t replicate directly from MySQL but if this option is available in the future we can attach a ColumnStore replication slave to any MySQL master and use the slave for reporting queries (i.e., BI or data science teams can use a ColumnStore database, which is updated very close to realtime). 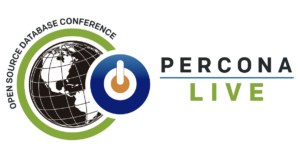 The Percona Live Open Source Database Conference 2017 is the premier event for the rich and diverse MySQL, MongoDB and open source database ecosystems. This conference provides an opportunity to network with peers and technology professionals by bringing together accomplished DBA’s, system architects and developers from around the world to share their knowledge and experience. Mongo Index Types, How, When and Where Should They be Used? MySQL 8.0: What is New in the Optimizer? What is Apache Kafka? How It’s Similar to the Databases You Know and Love, and How It’s not. Register for the Percona Live Open Source Database Conference here. Just a reminder to everyone out there: our Early Bird discount rate for the Percona Live Open Source Database Conference 2017 is only available ‘til January 8, 2017, 11:30 pm PST! This rate gets you all the excellent and amazing opportunities that Percona Live offers, at a very reasonable price! 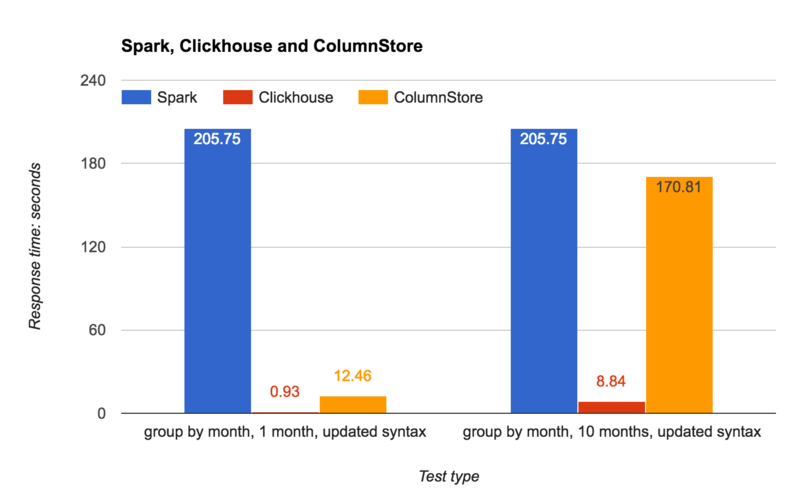 In my previous blog post, I wrote about using Apache Spark with MySQL for data analysis and showed how to transform and analyze a large volume of data (text files) with Apache Spark. Vadim also performed a benchmark comparing performance of MySQL and Spark with Parquet columnar format (using Air traffic performance data). That works great, but what if we don’t want to move our data from MySQL to another storage (i.e., columnar format), and instead want to use “ad hock” queries on top of an existing MySQL server? Apache Spark can help here as well. I’ve used the same “Airlines On-Time Performance” database as in previous posts. Vadim created some scripts to download data and upload it to MySQL. You can find the scripts here: https://github.com/Percona-Lab/ontime-airline-performance. I’ve also used Apache Spark 2.0, which was released July 26, 2016. To connect to Spark we can use spark-shell (Scala), pyspark (Python) or spark-sql. Since spark-sql is similar to MySQL cli, using it would be the easiest option (even “show tables” works). I also wanted to work with Scala in interactive mode so I’ve used spark-shell as well. In all the examples I’m using the same SQL query in MySQL and Spark, so working with Spark is not that different. will only scan 1300 rows and will return instant (0.00 seconds reported by MySQL).
. 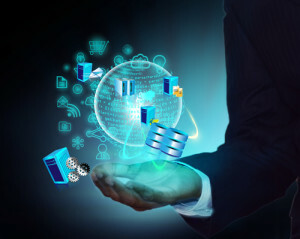 In MySQL, the query will use the index and all calculations will be done inside MySQL. Spark, on the other hand, will have to retrieve all IDs (select id from ontime_part) from MySQL and calculate maximum. That took 24.267 seconds. 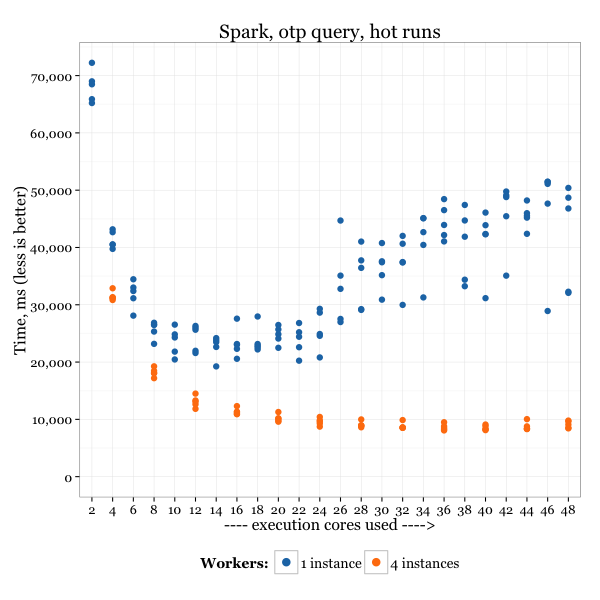 This is a followup to my previous post Apache Spark with Air ontime performance data. To recap an interesting point in that post: when using 48 cores with the server, the result was worse than with 12 cores. I wanted to understand the reason is was true, so I started digging. My primary suspicion was that Java (I never trust Java) was not good dealing with 100GB of memory. Following the last article’s advice, I ran four instances of Spark’s slaves. This is an old technique to better utilize resources, as often (as is well known from old MySQL times) one instance doesn’t scale well. Although the results for four instances still don’t scale much after using 12 cores, at least there is no extra penalty for using more. It could be that the dataset is just not big enough to show the setup’s full potential. I think there is a clear indication that with the 25GB HEAP size, Java performs much better than with 100GB – at least with Oracle’s JDK (there are comments that a third-party commercial JDK may handle this better). This is something to keep in mind when working with Java-based servers (like Apache Spark) on high end servers. 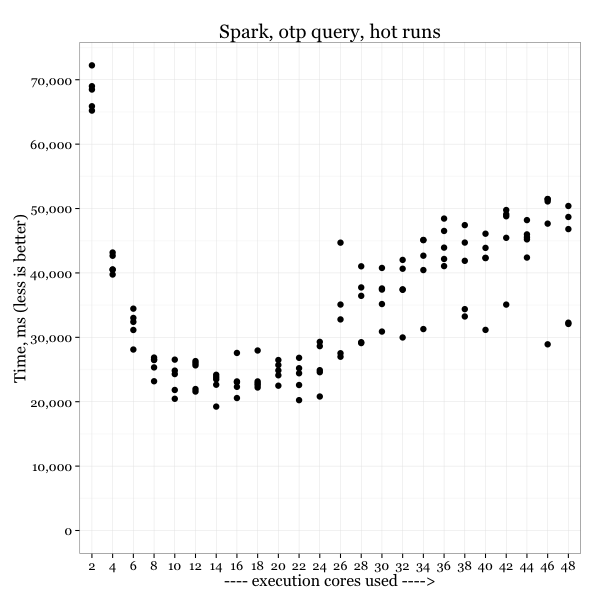 There is a growing interest in Apache Spark, so I wanted to play with it (especially after Alexander Rubin’s Using Apache Spark post). http://www.transtats.bts.gov/DL_SelectFields.asp?Table_ID=236&DB_Short_Name=On-Time. You can find the scripts I used here https://github.com/Percona-Lab/ontime-airline-performance. The uncompressed dataset is about 70GB, which is not really that huge overall, but quite convenient to play with. As a first step, I converted it to Parquet format. It’s a column based format, suitable for parallel processing, and it supports partitioning. Conveniently, by using just two commands (three if to count setting compression, “snappy” in this case) we can convert ALL of the .csv files into Parquet (doing it in parallel). The datasize after compression is only 3.5GB, which is a quite impressive compression factor of 20x. I’m guessing the column format with repeatable data allows this compression level. 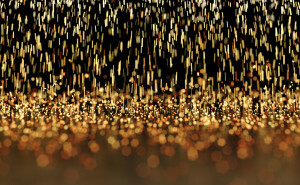 In general, Apache Spark makes it very easy to handle the Extract, Transform and Load (ETL) process. Another one of Spark’s attractive features is that it automatically uses all CPU cores and execute complexes in parallel (something MySQL still can’t do). So I wanted to understand how fast it can execute a query compared to MySQL, and how efficient it is in using multiple cores. "SELECT avg(cnt) FROM (SELECT Year,Month,COUNT(*) FROM otp WHERE DepDel15=1 GROUP BY Year,Month) t1"
I should note that Spark is perfectly capable of executing this as SQL query, but I want to learn more about DataFrame manipulation. which basically tells it to use from 2 to 48 cores (the server I use has 48 CPU cores) in steps of two. I executed this same query six times. The first time is a cold run, and data is read from the disk. The rest are hot runs, and the query should be executed from memory (this server has 128GB of RAM, and I allocated 100GB to the Spark executor). I measured the execution time in cold and hot runs, and how it changed as more cores were added. There was a lot of variance in the execution time of the hot runs, so I show all the results to demonstrate any trends. More cores seem to help, but after a certain point – not so much. The best execution time was when 14-22 cores were used. Adding more cores after that, seems to actually make things worse. I would guess that the datasize is small enough so that the communication and coordination overhead cost exceeded the benefits of more parallel processing cores. The hot execution time for the same query in MySQL (MySQL can use only one CPU core to execute one query) is 350 seconds (or 350,000ms to compare with the data on charts) when using the table without indexes. This is about 11 times worse than the best execution time in Spark. "ALTER TABLE ontime ADD KEY (Year,Month,DepDel15)"
then we can improve execution time to 90 seconds. This is still worse than Spark, but the difference is not as big. 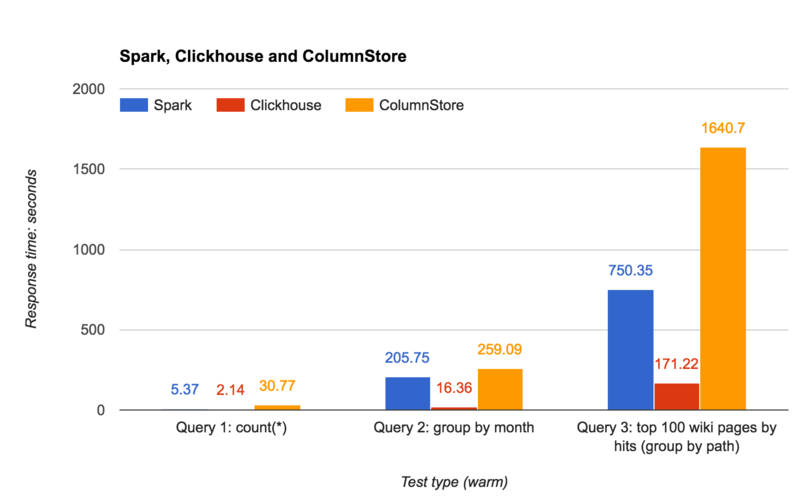 We can’t, however, create index for each ad-hoc query, while Spark is capable of processing a variety of queries. it did not scale well with multiple CPU cores. I wonder if the same problem appears when we use multiple server nodes. If you have recommendations on how I can improve the results, please post it in comments.